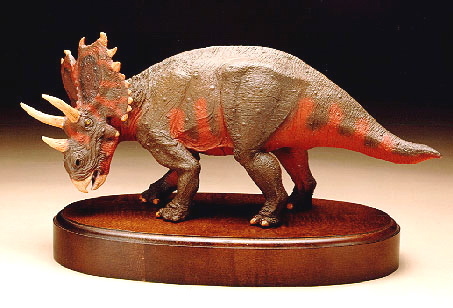 Having a big head with lumps, bumps, horns and a big "frill" protecting my neck pegs me as a Ceratopsian. A family of Dinosaurs that has as its best known member the Triceratops but included many other species as well including Styracosaurs, Chasmosaurs and whole bunch more. Dinosaur toy. 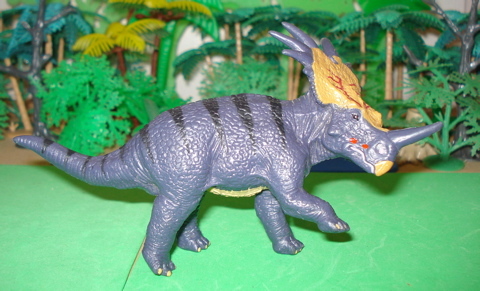 It was followed in 1964 by the very similar but slightly smaller MPC Styracosaurus. 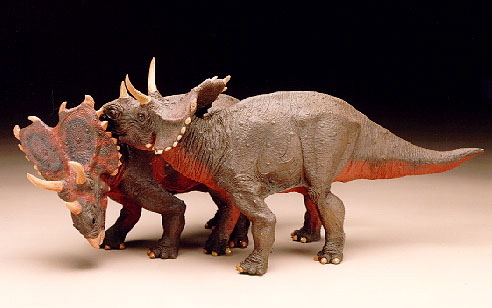 For the next thirty-plus years these two Dinosaur toys were the only Dinosaur toys Ceratopsians, that weren't Triceratops, available for the Dinosaur toys toy-box. 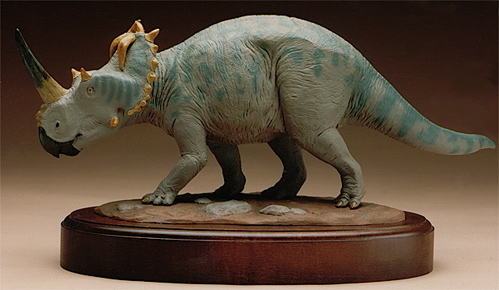 1994 saw the still fabulous Boston Museum of Science, Battat Styracosaurus (Below) modeled by Gregory Wenzel of The Dinosaur Studio. These have become definitive collectibles. 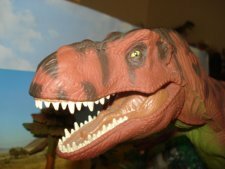 Dinosaur toys series (Above) by Safari Ltd. This has since experienced a brightening repaint from the basic police blue and tan as seen here. in the Torosaurus. A very Triceratops looking Dinosaur, but definitely isn't. It has the largest frill of any known member of the Ceratopsians family. 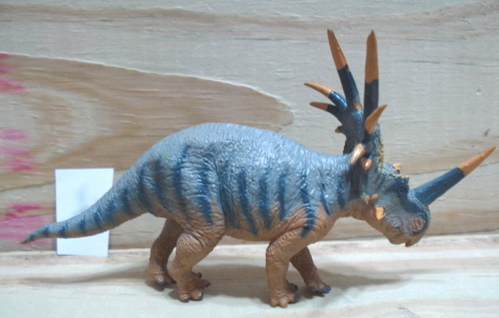 Styracosaurus (Above) is really quite good in terms of its shape and form. The head is a tad narrow but I really like it and wish that I had several more. 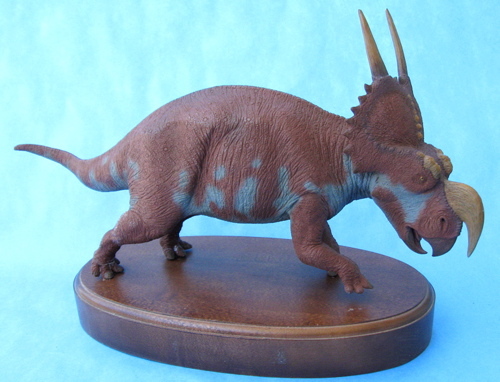 In the same year, and seemingly from the same factory, came what is labeled as a Triceratops (says so right there on its belly) but given the size and shape of the 'frill' it really looks a lot more like a Torosaurus or Chasmosaurus (Left). 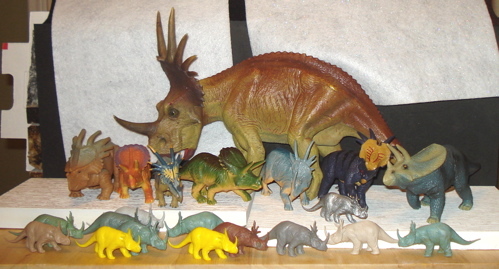 That Centrosaurus and Einiosaurus look like great Dinosaur toys candidates to me! 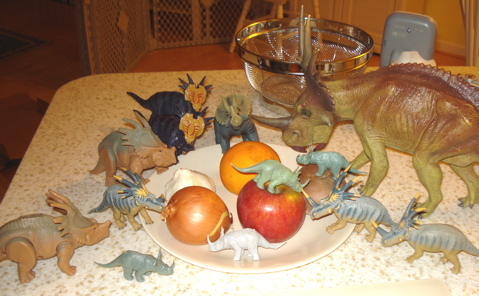 When it is just a bit too frigid to risk horns and frill-bite in the outside world (Above) the smart Dinosaur toys Ceratopsians gather 'round the fruits and veggies buffet served in the Dino-town cafeteria (Below). The Ceratopsians ranged from three to thirty feet (1-9.2 meters) in length and weighed from several hundred pound to ten or so tons (0.3-10+ tons). They all had enormous heads, horns to a greater or lesser degree and that frill or crest on the back of their armored heads. They inhabited the Cretaceous Period (145.5-65 mya) surviving in one form or another for eighty-odd million years. Quite a spectacular lifeform. Just click on the Ceratopsian link to go to that figure-page. Please note that Triceratops, while a family member, has its own page. 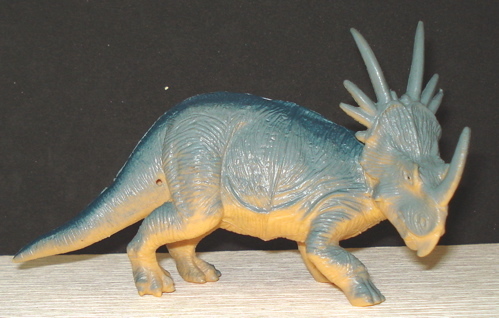 Disney Styracosaurus (2000) Made for McDonalds Corp.
More Ceratopsians will be added to this list as I come across them. 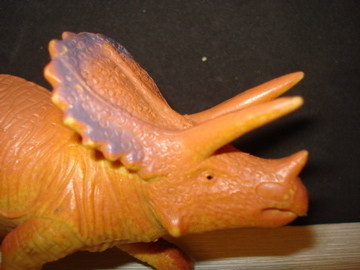 One that I do not have, and have never seen, is the out-of-production 2002 Carnegie Styracosaurus which "retired" (I am sure it was given no choice) in 2005. Perhaps a new one is in the wings? 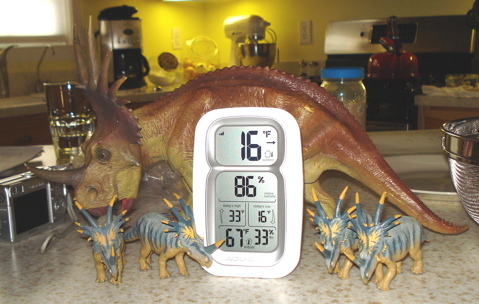 The Ceratopsians are a large and spectacular family of Dinosaurs and hold an important place in any Dinosaur toys collection. Having a large number (more than three or four) of any one figure is not excessive as they were herd animals. While the Marx and MPC are in ~1/52 scale the others (Battat, Safari, China, etc) are all in 1/40-45 and play with each other very well. The X-Plus is less of a "toy"; hollow and made of hard plastic it is in 1/10 scale and comes painted (pictured) and unpainted. 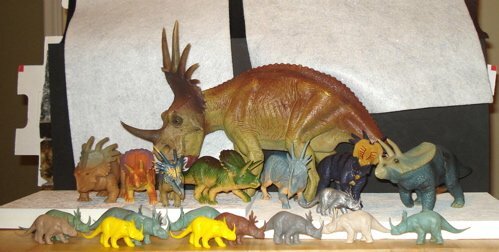 There is still a plethora of Ceratopsians awaiting translation into new and different Dinosaur toys for those of us who care. 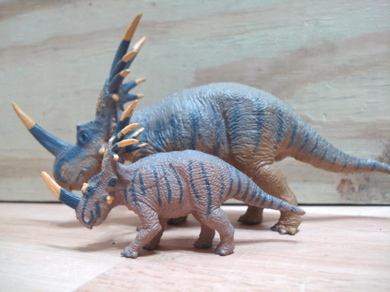 The Battat Styracosaurus is still the best of these although the Safari Ltd. is a close second and Safari has been renovating and revising their entire line of late. 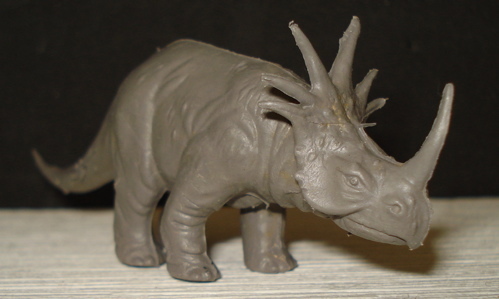 I look for great new Ceratopsian figures in the near future.